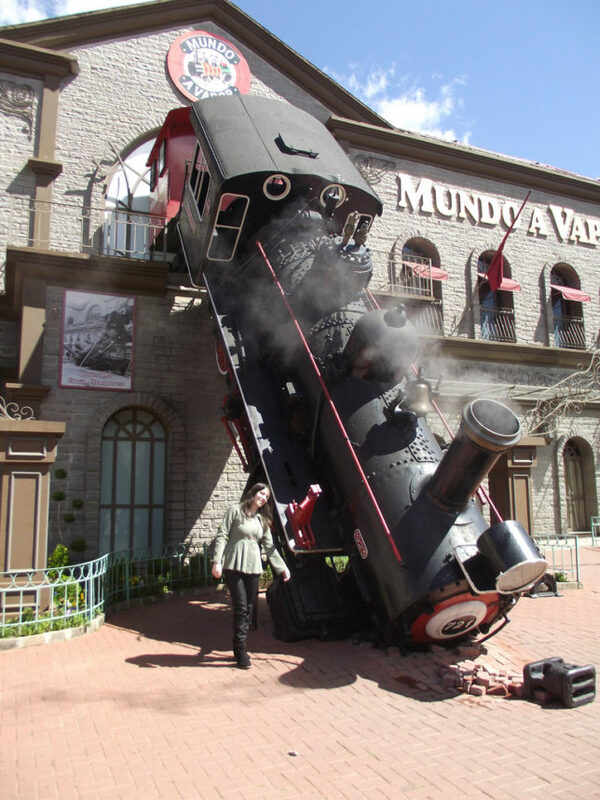 The front facade of the Mundo a Vapor train museum in Canela, Brazil recreates a spectacular Parisian train wreck from 1895 in steamingly accurate detail. 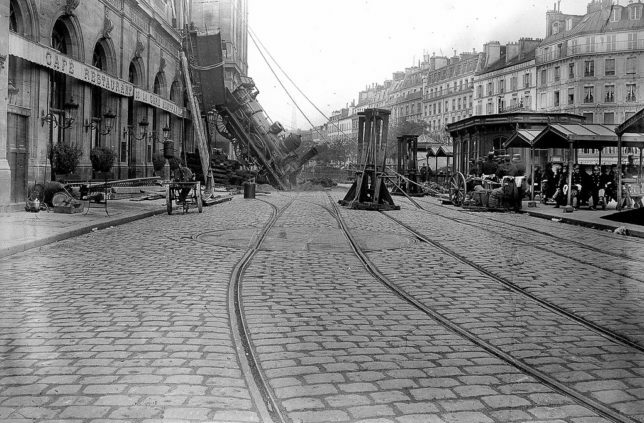 No doubt the worst – or at least, the most embarrassing – day in the history of the Chemins de fer de l’Ouest railway was October 22 of 1895, the date of the Montparnasse Derailment. Captured for posterity through the miracle of photography, this epic urban train wreck saw the twelve-car Granville to Paris and Montparnasse Express train enter the Gare Montparnasse station at too high a speed, suffer a brake failure, smash through safety buffers, careen 100 feet across the station concourse, and finally burst through the building’s outer wall, falling 30 feet into the street below. Ta da! Steam locomotive No. 721 was hauling 10 coaches and 131 passengers at the time. The only fatality of the spectacular crash, however, was a woman in the street who was struck by displaced masonry while waiting for her husband. Though CF de l’Ouest was absorbed into the French national rail system in 1909, their day of infamy lives on, day after day, thousands of miles away in Brazil. Flickr member RV1864 has posted several photographs of the accident and the subsequent cleanup, two of which are presented above. Fast-forward 96 years and fast- er, sideways 5,837 miles to Canela, a charming town of 40,000 set jewel-like in the Gaucho Highlands of Rio Grande do Sul. 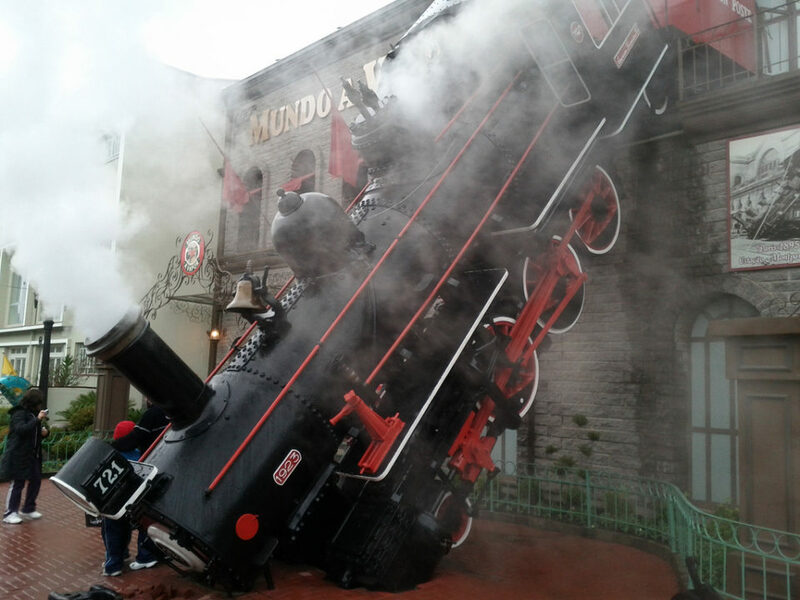 Canela (Portuguese for “cinnamon”) is a popular tourist destination boasting several noteworthy attractions including Mundo a Vapor… the “World of Steam” train museum and theme park, which opened in 1991. 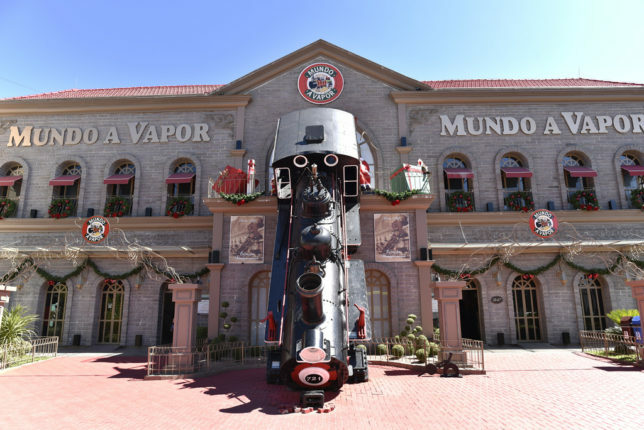 It’s hard to miss Mundo a Vapor, just like it was hard to miss a major train station in Paris… we’re looking at you, engine driver Guillaume-Marie Pellerin. Unlike the old (demolished in 1969) Gare Montparnasse train terminal, over-achieving locomotive No. 721 is a feature, not a bug… and yes, the replica engine proudly displays its ID ‘cuz if one’s gonna troll, might as well troll to the max. These images from Flickr members Rosanetur and Solon Aguiar (solonneto) date from November of 2017 and September of 2012, respectively. 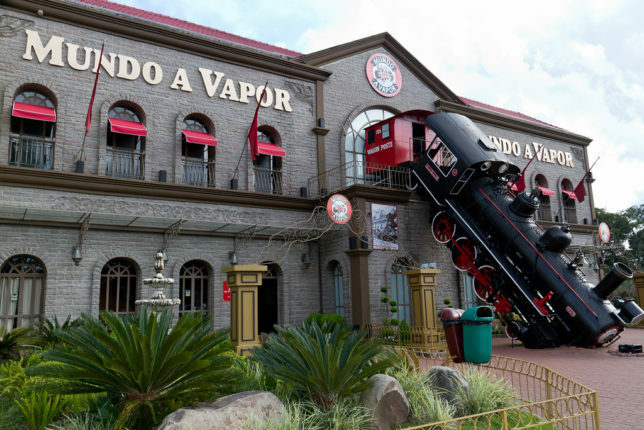 Mundo a Vapor isn’t your average train museum and calling it a “theme park” is a bit of a stretch – the only real “ride” is a small steam train that, perhaps fortunately, does NOT crash through the second-story wall. What’s up with that? Here comes the history! 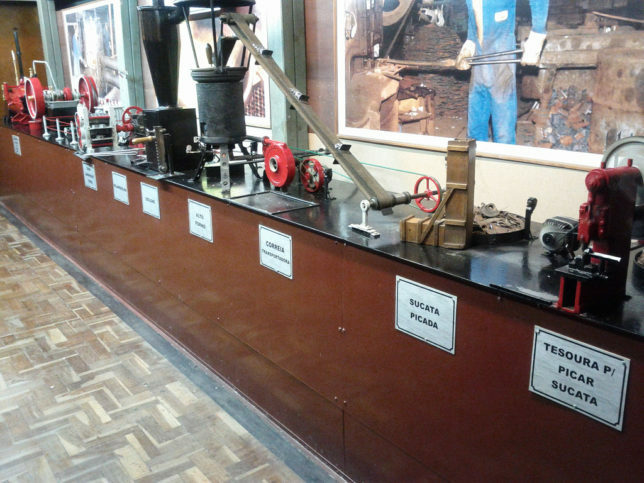 Back in the 1920s, Ernesto Urbani ran a small business servicing and repairing the steam engines used at many of the local sawmills. Urbani’s sons Omar, Benito and Hermes spent their childhoods in the shop, learning all about steam engines and crafting miniature versions in their spare time. 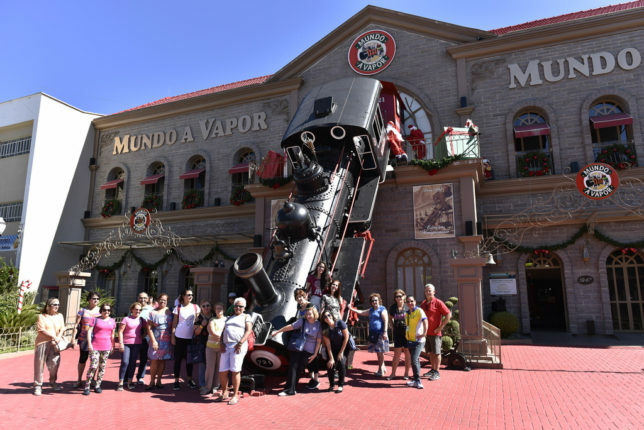 The boys – now retired gents – opened Mundo a Vapor in 1991 as both a tribute to their father and an homage to their love of all things steam. 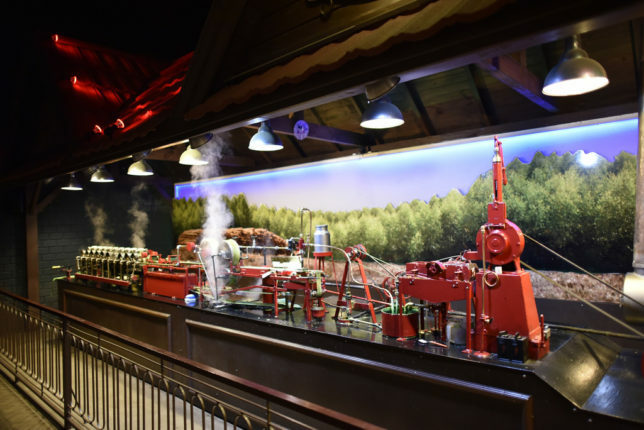 As such, Mundo a Vapor isn’t so much a museum of railroads as it is a showcase of the Urbani’s many handmade steam engines and miniature mechanical devices. For example, one steam-driven machine presses pulp into usable paper while another spits out pot-metal souvenirs cast from molten solder. 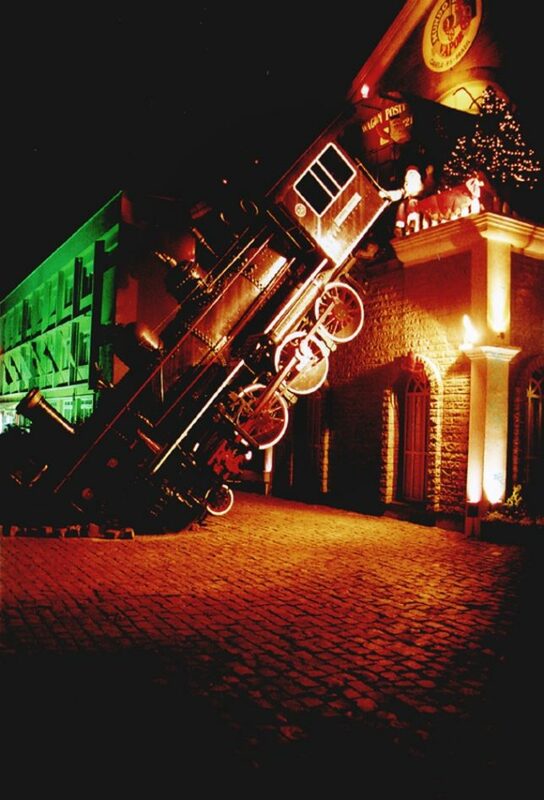 Not exactly thrilling but hey – there’s always the replica crashed locomotive out front for photo opportunities. Be sure to snap the shutter when the stack belches thick white smoke. Flickr members Contato Dearaujo and Cesar Cardoso captured these scenes (and our lead image) in April of 2014 and June of 2011, respectively. Canela (along with its sister city Gramado) lies on the so-called “Rota Romantica” and it’s popular with tourists year-round. Successive waves of immigrants from the Azores, Germany and Italy have influenced the town’s architecture, not to mention its overall European character. Snow often falls during the winter, prompting extensive Christmastime events and activities. 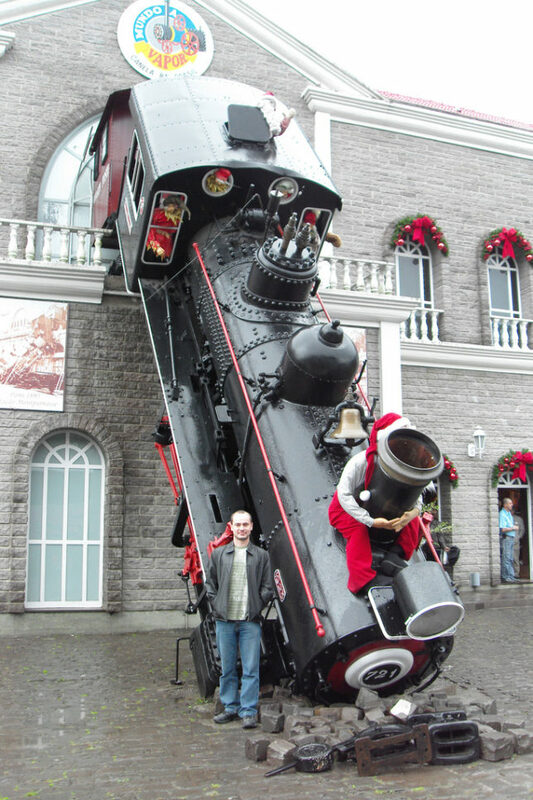 Someone better tell Santa that reindeer can’t fly but steam locomotives can… for a few seconds. Flickr member Anderson Rancan snapped some of the holiday disaster fiasco fun in late 2008. 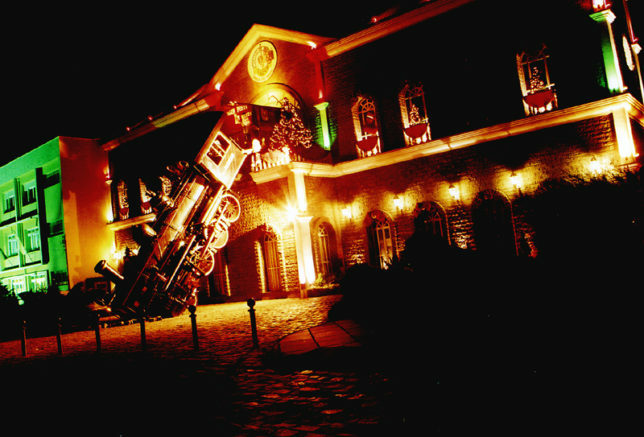 Flickr member Jeff Belmonte brings us these night-time images of Mundo a Vapor’s crash-tacular facade taken in early 2006. 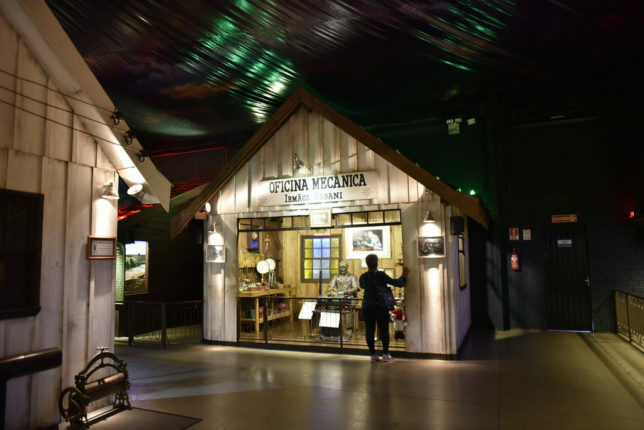 Flying down to Rio – or a tad farther, to the Sao Paulo region – isn’t an option for many in the Northern Hemisphere but thanks to Mundo a Vapor you can pay a five-minute visit to the museum via this video. 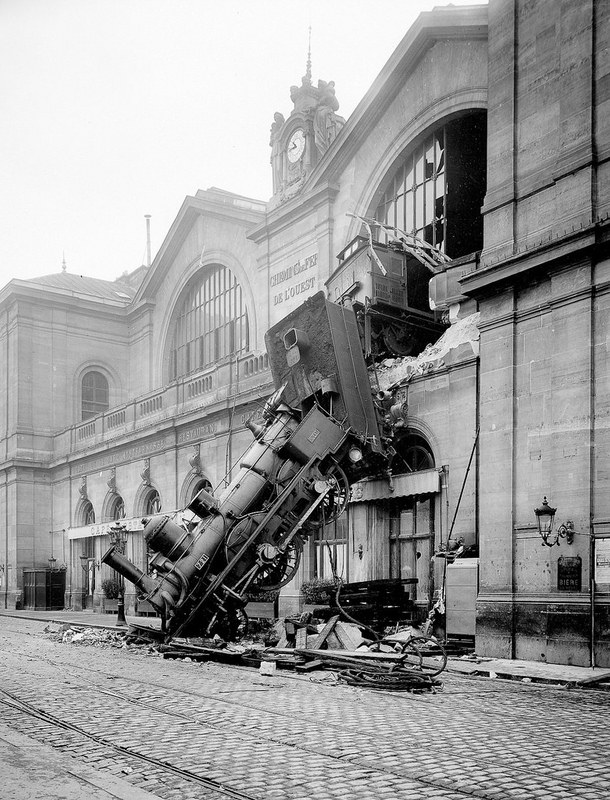 In the meantime, and to paraphrase Bogie from Casablanca, “We’ll always have the Paris trainwreck” thanks to those masters of steam (and trolling), the brothers Urbani.